If so, then it’s likely you found your match. The Rawlings Ash Professional Ash Wood bat is a basic wood bat made to overstock in Rawling’s mill. They take their extra pieces of wood that don’t quite pass the grade as an official pro model (but still very much usable) and lathe … Jump to the full review. We aren’t the only ones to have information about the Professional Ash Unfinished. Other places, in particular those who sell bats, usually have a boiler plate write up on the specs of a bat. Many of those we reference to make sure we are seeing what we should be. Here are some more references for the 2019 Rawlings Professional Ash Unfinished review. If so, then it’s likely you found your match. The Rawlings Ash Professional Ash Wood bat is a basic wood bat made to overstock in Rawling’s mill. They take their extra pieces of wood that don’t quite pass the grade as an official pro model (but still very much usable) and lathe them down into a wood bat. 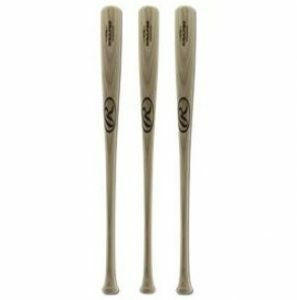 Throw on a Rawling’s logo, no finish, and they out the door. Cheap too. If you need a wood bat, or want to jump into the market, then the Ash Wood Unfinished wood bat from Rawilngs is a good get. Don’t expect too much in terms of overall look. But, its a straight forward bat that Ted Williams would be proud to swing. There a lot of wood bats out there. Some cheap, some not so much. But, you can find unished bats with easy by simply searching unfinished wood bats on a place like Amazon. Some are branded with a famous brand, others not. There isn’t much to a wood bat at this level of quality. The Rawlings unfinished ash bat is a single piece of ash wood lathed into a bat. They come in a few different model sizes and you don’t get too choose which one. But, it will be an average sized barrel with an average swing weight. Expect a well crafted bat that is, after all, an ash stick. You can read more about the differences between the bat wood types here. But, in short, Ash is a softer bat with a little more give at contact when compared to an Maple bat. Most think of Ash as a beginner or entry type model although there are at least a few pro guys that use ash and like it. In the end, the differences in hardness between one wood and another is, at best, marginal. Although, we should note, Maple is the preferred bat these days in the pros. Expect a 33, 33.5 and 34 inch bat size. We’ve yet to see a 32-inch, but we haven’t been looking for too long. Quite possible Rawlings only makes this bat in a 33+ inch.